Brilliant, isn’t it? 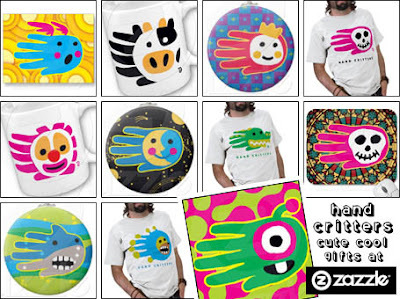 Hand Critters is Zazzle a shop that creates colourful character designs using simple hand prints as its starting point. And the results are an absolute joy to behold - it’s got monsters, it’s got frogs, it’s got ladybugs, it’s got aliens, it’s got unicorns, it’s got hippos, it’s got hedgehogs… in fact, it’s got just about everything you could ever think of! It’s even got a 2012 US electoral candidate! Absolute artistic genius! Enjoy! Thanks SO much for this awesome review of the Hand Critters. You and your readers are invited to join us in Facebook to stay up to date about our new critters and other news. Today is International Red Panda Day, let's celebrate!